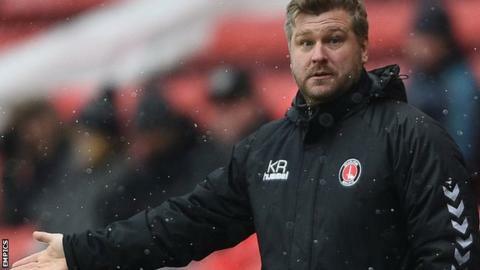 Karl Robinson has parted company with League One club Charlton Athletic after 16 months as manager. Robinson, who took charge at The Valley in November 2016, has left the Addicks ninth in the table, five points off the play-off places. Assistant manager Lee Bowyer and player-coach Johnnie Jackson have been placed in caretaker charge. "The club and Karl came to an agreement that is best for everyone involved," Charlton director Richard Murray said. "I'd like to place on record our thanks to Karl, who has worked tirelessly during his time at Charlton." Robinson revealed his frustration earlier this month at a protracted takeover process at Charlton, telling BBC Radio London the situation was "completely up in the air". "Moving on now was not an easy decision for anybody," the former MK Dons boss said. "But it's what's best for the club and everyone involved. "Lee and Johnnie have been fantastic during my time here and I have no doubt I'm leaving the club in good hands."